The career of Steve Miller and the various incarnations of his band runs parallel with the development of classic American rock music. Texan born Miller migrated to California to play hard electric blues with Barry Goldberg before catching the prevailing psychedelic trend in Los Angeles and San Francisco. The Steve Miller Band were pretty much an instant success, partly because they were tighter and more proficient than most of the jam rambling competition. Miller’s first albums are masterpieces of the emergent acid rock movement, but they also rely on a cool bedrock of blues structure and some wildly innovative electronic treatments. In the early seventies Miller flirted with a more introspective soulful style before discovering a renewed interest for his work via a string of smash hit singles and albums that turned him from a successful cult figure into a total superstar. His legendary albums like The Joker, Fly Like an Eagle and Abracadabra also display the common touch, making him a regular multi-platinum platinum seller. Since that time Miller has bolstered his appeal to the radio and college crowd by avowing to perform his greatest hits (plus many lesser known gems) with all the panache and freshness he can muster. A superb guitarist, songwriter and vocalist, Miller is an American institution. We have a sublime selection of his finest work. It’s such a pristine catalogue there is no hesitation in recommending you check him out from the beginning. Raised in a musical and academic family the young Miller was surrounded by blues legends that came to visit his parents. Subsequently his own teenage groups displayed his rapidly growing talents. After cutting his teeth with a stint backing Chuck Berry (they recorded The Live at the Fillmore Auditorium disc), Miller and his Band won a landmark contract with Capitol and having recruited musician Biz Scaggs to join his rhythm section the troupe decamped to London to record their debut Children of the Future at Olympic Studios in early 1968 with Englishman Glyn Johns at the helm. 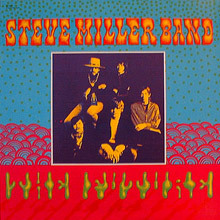 At this point the Steve Miller band is a democracy of sorts with Jim Peterman’s atmospheric keyboards underpinning Tim Davis’s drums and vocals and Lonnie Turner’s super funky bass guitar. The SMB took a psych rock blueprint and ran riot on the title track, ‘The Beauty of Time is That’s Snowing (Psychedelic B.B. )’ and the trippy ‘In My First Mind’. However their R&B roots also shine through on Scaggs' moody ballad ‘Baby’s Calling’ Me Home’ and Buster Brown’s rolling ‘Fanny Mae’. As debuts go this is immaculate and fully deserves reappraisal. It’s a five star wonder. Sailor (1968) may be even better. It’s certainly a regular entry in most discerning critics Best 100 Albums of all time lists. Sticking with Johns but moving to Burbank to record Miller now brings in a battery of synth effects on ‘Song for Our Ancestors’ – whale noises from the deep included – and also introduces one of his soon to become familiar alter egos in the shape of the irresistible ‘Gangster of Love’. The album is notable for other items like ‘Living in the USA’, which would eventually become a hit in its own right and Scaggs’ rock soul brother vocals on ‘Overdrive’ and ‘Dime-a-Dance Romance’. The albums Brave New World and Your Saving Grace did the trick again in 1969 while Number 5 (1970) took a side trip to Nashville to team the band with country luminaries Charlie McCoy and Buddy Spicher. There now follows a brace of ludicrously under-appreciated albums: Rock Love (1971) and the utterly beguiling Recall the Beginning…A Journey from Eden (1972). If the former combines slick live electric blues with fiery poppy moments in the brilliantly speedy title cut and the lurching ‘Let Me Serve You’, the latter is an extended amalgamation of Miller soul, enigmatic lyrics, thoughtful arrangements and the best melodic breakdowns known to West Coast music. The evolution of the album on side two is assisted by Jim Keltner’s drumming and regular cohort Ben Sidran’s ability to fuse his keyboards to Miller’s languid singing and immaculate guitar prowess. Completely recommended. At this time we find Miller hasn’t really broken out as he should have but Anthology covers his first five albums and will go Gold in its own right. Here’s the chance to pick up on overlooked tracks like ‘Kow Kow Calculator’, ‘Going to Mexico’ and ‘My Dark Hour’ which features Paul McCartney on guitar, bass, drums and backing vocals. Anthology closes an appropriate chapter but what will follow sees Miller transcendent. The Joker (1973) simply soars thanks to the radio smash title track, abundasnt choppy chords and space jams. While it became fashionable to think that Miller had abandoned his previous bluesy psych styling that isn't the case here. The live ‘Come On in My Kitchen’ and ‘Something to Believe In’ still sound like vintage Miller Band. Fully in the spotlight now Miller’s Fly Like an Eagle would become a 4xPlatinum seller thanks to the central piece and the ear worm hits ‘Take the Money and Run’ and ‘Rock’n Me’ A fabulous set it’s even more vital as a remastered 30th Anniversary Edition with unreleased demos, a documentary and live DVD all in 5.1 Surround Sound. It sounds glorious. Book of Dreams is another highlight from the classic rock seventies with a mid-period San Francisco acid art cover to boot and swinging hits such as ‘Jet Airliner’ and ‘Jungle Love’ ensuring another high quality release. Greatest Hits (1974-1978) is a handy companion to Anthology that would sell over a million copies and achieve Diamond status. The new release restores the full-length album (rather than single edit) versions and adds up to fourteen cuts of prime Miller. With harmonica player Norton Buffalo now a regular member the Miller band hits the ‘80s with Circle of Love and Abracadabra – another combination of impeccable rock pop writing. Yet again there will be a subtle change in direction on Italian X-Rays, which marks the final partnership with drummer Tim Davis) and Living in the 20th Century where familiar blues riffs are mixed with tasty radio fare like ‘I Want to Make the World Turn Around’. Since the new millennium Miller has continued to mine a productive seam of blues ancient and modern and has also delivered great jazz standards in his own style and returned to more experimental phases. We close out with the comprehensive collection The Best of Steve Miller Band 1968-1973 and 1994’s magnificent Steve Miller Band Box Set which traces the young Miller’s beginnings when T-Bone Walker encouraged him to play guitar right in the family front room through to the digital era. The 3-CD set is packed with goodies and rarities and comes with a splendid booklet. Since Miller continues to record and perform to this day to appreciative listeners and packed houses this is an ongoing story. The origins of the tale are to be found above. Steve Miller is an artist to cherish. Every home needs some Stevie ‘ Guitar’ Miller. 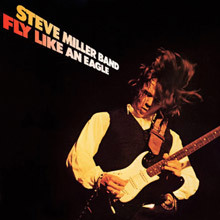 Fly Like an Eagle is the ninth studio album by American rock group Steve Miller Band. The album was released in May 1976 (see 1976 in music) by Capitol Records in North America and Mercury Records in Europe. A Quadraphonic mix of the album was available on the Quadraphonic 8-Track cartridge format. The album was a success, spawning three singles, the title track, "Take the Money and Run" and "Rock'n Me", and eventually receiving quadruple platinum certification from the RIAA. In 2003, the album was ranked number 450 on Rolling Stone magazine's list of the 500 greatest albums of all time. On an updated list in 2012, the magazine listed the album at number 445. In 2006 the album was re-released to celebrate its 30th Anniversary. The CD is digitally remastered and includes three bonus tracks and a bonus DVD features a concert performance at Mountain View, California's Shoreline Amphitheater in 2005 with over two hours of music in 5.1 Surround Sound. Guest musicians include George Thorogood and Joe Satriani. The DVD also features a lengthy interview with Steve Miller, archive footage, never-before-seen photographs, and early demo recordings. 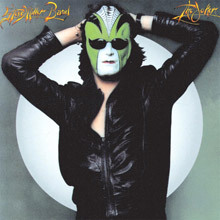 The Joker is the eighth album by Steve Miller Band, released in 1973. The album marked a period of significant change for the group as the band abandoned their psychedelic oriented music for a more melodic, smooth rock/blues sound. Perhaps not coincidentally, it was also their first solid commercial success due to the strong radio-play of the title track. The title track took 19 days to record. The album reached #2 on the Billboard 200 and has been certified Platinum in the United States. The artwork of the album is also considered amongst the greatest; for example Rolling Stone would later rank it as one of the "Top 100 Album Covers Of All Time". 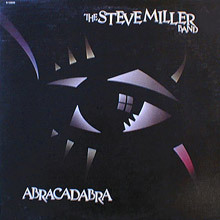 Abracadabra is the twelfth studio album by American rock band Steve Miller Band, released in June 1982 by Capitol Records in North America and Mercury Records in Europe. Abracadabra charted in nine countries, including Germany where the record reached #1 for a week. Three singles were released from the album, the title track, "Cool Magic", and "Give It Up", respectively, with the title song charting the highest. Sailor is the second studio album by American rock band The Steve Miller Band, released in October 1968 by Capitol Records. 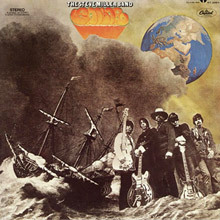 Like The Steve Miller Band's previous album, Children of the Future, Sailor was produced by Glyn Johns; but unlike its predecessor which was recorded in London, England, Sailor was recorded in Los Angeles, California. It was the last Steve Miller Band album to feature contributions by Boz Scaggs. Children of the Future is the debut album by American rock band Steve Miller Band, released in 1968 by Capitol Records. The album was produced by notable British record producer/engineer, Glyn Johns, who would go on to produce another American band, The Eagles. 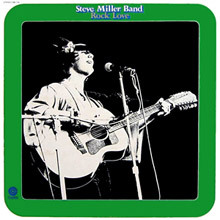 Rock Love is the sixth album by American rock band The Steve Miller Band, released in 1971. It featured Ross Valory (a future member of Journey) on bass, and Jack King on drums. Bobby Winkelman was in the band (having moved back to rhythm guitar) during the live recordings on the album's first side, but is not credited on the album cover. David Denny, who later joined the band in 1976, is a guest guitarist (again, not credited) on "Blues Without Blame". The album consists of three blues-rock tracks recorded live, including lengthy jam-style "Love Shock" which lasts nearly 12 minutes and includes an extensive drum solo, and four studio tracks. The first song starts with the words "I'm going to play you some blues 'cos I know you like that". 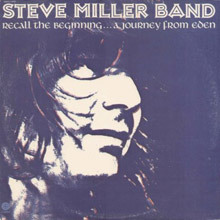 Recall the Beginning...A Journey from Eden is the seventh album by American rock band Steve Miller Band, released in 1972. 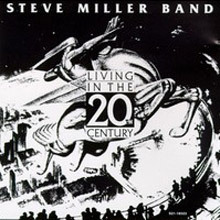 Living in the 20th Century is the fourteenth album by American rock band The Steve Miller Band, released in 1986. It includes the hit "I Want to Make the World Turn Around", which spent six consecutive weeks at the top of the Album Rock Tracks chart in the U.S. at the end of 1986. Steve Miller Band - Steve Miller Band Live! Steve Miller Band Live! 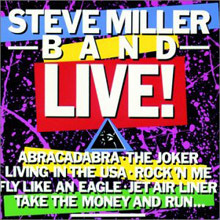 is a 1983 live album by the Steve Miller Band. Recorded live at the Pine Knob Amphitheater, Detroit, MI on September 25, 1982. 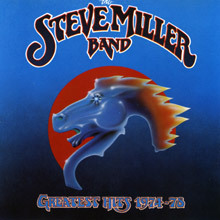 Greatest Hits 1974–78 is a compilation album by the Steve Miller Band released in November 1978. It has sold thirteen million copies in the United States and is ranked 37th on the Recording Industry Association of America list of best selling albums. It also achieved Diamond certification in Canada (1,000,000 units) in 2003. Two singles that reached No. 1 are "The Joker" which topped the charts on January 12, 1974 and "Rock'n Me" on November 6, 1976.